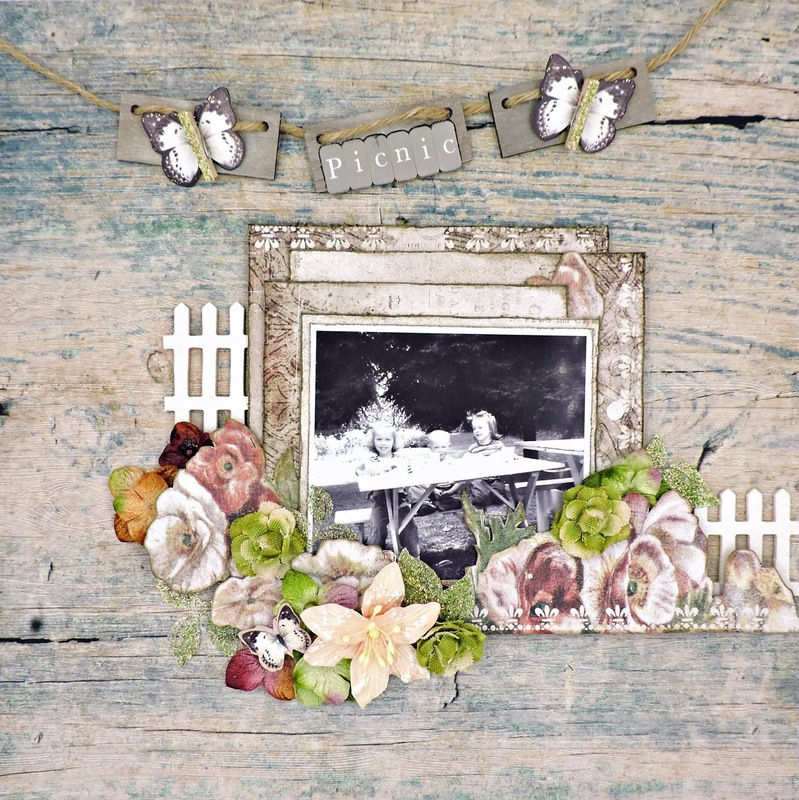 My next layout using the August Tranquility kit from Swirlydoos features more of the Blue Fern Studios Tranquility collection. I wanted a more rustic look for this photo, so I chose to use the reverse side of the Jubilation sheet for my base and the Serenity page for my matting and embellishing. First, I fussy cut the flowers that run across the bottom; then I cut the rest of the papers in various sizes to form my matting. These were lightly distressed and inked before being assembled and stapled together and then adhered to my picture. Meanwhile, I took out some of the fun pieces that Krissy had included in the main kit: DoCraft Country Life wooden signs, Craftwood picket fencing from Darice and a couple of mini clothespins. The wooden signs were first colored with Ranger Distress Ink in Pumice Stone. When the ink was totally dry, I lightly swiped them with watered down gesso that was left from whitewashing my fence pieces. Before gluing the clothespins to the butterflies, I ran a bit of 1/8" Score Tape along the tops and coated them with the BFS glitter in Army Dust. This same glitter was used to coat the Foliage stickers by Queen & Co. that, along with the Magnolia Lane die cut ephemera by Ultimate Crafts, was included in the Embellishment add-on. That beautiful water lily by BFS came in the main kit; the Petaloo blooms were part of the Flower add-on. The one thing from my stash is Prima's alphabet stickers from the Divine Collection. That's me, my brother Jack and my sister Jean enjoying our meal at the picnic table that our father built just for us in 1952. Back in the summer days before air conditioning, my mother would prepare such dishes as potato and macaroni salads and baked beans in the cool of the morning to avoid heating up the house. Dad would cook the meat out on the brick grill next to the picnic table and we would often eat outside. There was a rainy day option - a back porch with windows along one wall that would open up to give us a breeze through the screens.